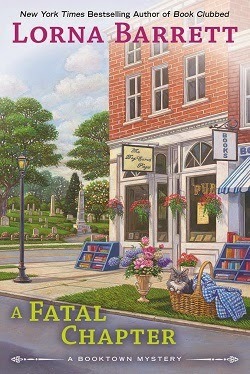 Cozy Chicks: The next Booktown Mystery! While out walking Sarge, Tricia is led by the agitated dog to a man lying in a gazebo. She’s startled when she recognizes Pete Renquist, the president of the Stoneham Historical Society, who appears to be suffering from cardiac arrest. When Pete later dies in the hospital, the discovery of a suspicious bruise and a puncture mark on his arm suggests he may have been murdered. Yeah, that's a lot of the story, but not what I consider the most important part of the book. So I wrote a shorter version, that I think introduces the most important aspect of the story. Have you ever been on a ghost walk? The Stoneham Historical Society plans to give nighttime tours of the Stoneham Rural Cemetery, but someone wants to prevent that--taking extreme measures. Can Tricia figure out who is behind the attacks before someone else becomes the cemetery's newest resident? What's your take on the story? Are you intrigued by either description? If so, which one? Should they be combined? Love the cover. I can't wait to see where the story goes! Is it June yet?! I'll be placing a preorder for sure. I like your description best and LOVE the cover! I enjoy your books no matter the cover. It could be on the shelf in a plain brown wrapper and I'd buy it. It's your wonderful writing that makes the book not the artwork. I think the first one sounds more like one of my short reviews, where I'd say "and if you'd like to know who did it, go out and beg, borrow or steal the book". Your much shorter one is all that should have been needed. I love the cover. To a potential buyer, I think I would like the two descriptions on the back. I have pre ordered mine already. Congrats on another Booktown Mystery. 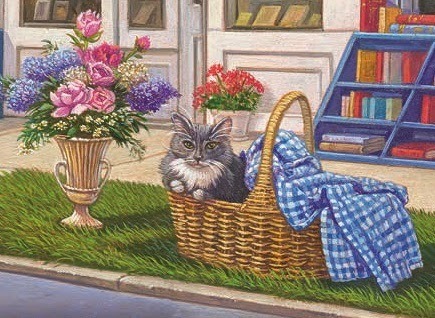 I love this cover - especially the cat in a basket. In all honesty the first time I ever picked up one of your books was because of the cover. The fact that it was in the mystery section made it that much better. And now I love them all. I love the cover art; that is what draws me in to take a closer look at what is behind that cover. And, I do like your "blurb" best, but I do like the second half of the marketing departments "blurb." But, no matter what, I am excited to read #9, I have been waiting. Thanks for the books and happy writing. I like the short version. It is a lovely cover. I preordered the book. Sorry but, I prefer the publisher's summary of the book. Love the cover and prefer your blurb. Publisher's is too wordy! I could have sworn I had some of the books in this series. But not seeing any on my TBR shelf.